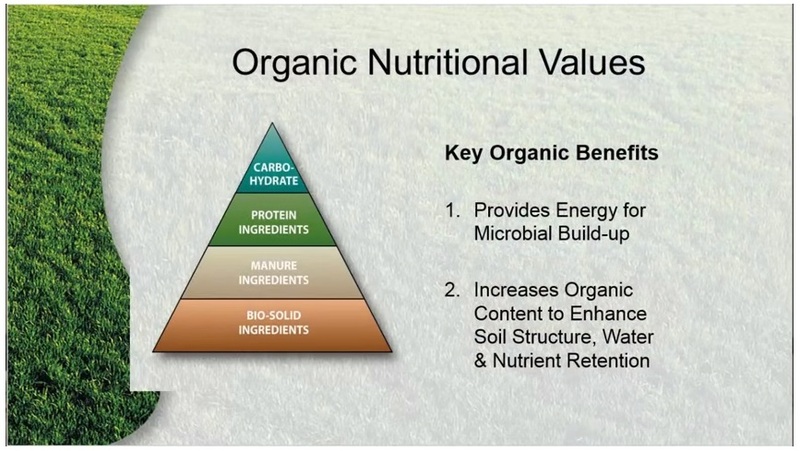 When we're discussing about an organic fertilizers we're totally talking about nutrient management keeping microbial activity alive and then having the carbon or bio reserves in that soil. So that those microbes can regenerate and regenerate and keep going. Organic fertilizer benefits obviously it provides energy for the microbial build-up. We've talked about that it increases the organic content to enhance the soil structure, water, and nutrient retention. As the soil gets better. It holds more water and nutrients. As that soil profile holds more water nutrients it's not just running off across the curb because we can't get any water in it it's not just straight leaching all the way through. It's holding that water now the soil is acting as your reservoir and you've got a much much longer cycle in between your irrigation. Carbon based products is you get that carbon and that organic in the soil profile working. It doesn't want to leach out, it won't leach out because the soil is now working for you and it stays there, adds energy rich diet too tired soils so as you're putting carbon based products in there. Now those collapse oils are getting or getting a little reserve to come back. they're getting stronger builds up that microbe stabilizes the root zone. It improves the nutrient and water retention in that soil and promotes rooting and lateral growth, now that we have air space, now that we have water space, now that we have pore space built into that soil, now your roots can go deeper, infrequent watering, healthier plants, and better root structure. The world of fertilizers can be complex. But it all hinges on three letters N, P and K. These are the three macronutrients that are essential for plant growth. Nitrogen, phosphorus, and potassium. Nitrogen gets top billing because it's responsible for keeping plants green which is why fertilizes for grass tend to have a high end factor. Nitrogen also feeds new shoots and plant growth. Phosphorus builds healthy roots and promotes fruiting and flowering so you'll often see fertilizer. In nature plants usually pick up phosphorus through decaying organic matter, you can apply it to your garden. Potassium which is also called potage is key in the formation of chlorophyll and other plant compounds. It improves disease resistance and general plant health. What makes organic fertilizers better than manufactured chemical fertilizers? After all, nitrogen phosphorus and potassium the nutrients the plants require most are chemicals, so what's the difference? Natural organic fertilizers feed your plants while building the soil. Repeated applications of inorganic fertilizers which usually provide only the three macronutrients N, P, and K can deplete soils while harming earthworms and microorganisms that keep soil live and make nutrients available to your plants. Organic fertilizers provide the secondary nutrients, calcium, sulphur and magnesium, and the trace nutrients boron, chlorine, manganese, iron, zinc and copper. These nutrients are necessary in varying amounts and all are easily depleted in soils treated only with chemicals. Using natural organic fertilizers in combination with soil amendments such as compost which contains lots of organic material, keep soil alive. Soils rich in organic material remain loose and airy hold more moisture and nutrients, foster the growth of soil organisms and promote healthier plant root development. It can be when choosing a fertilizer remember that more isn't better. Plants can only take in so much so organic versions release lower amounts over time. Chemical fertilizers release an overload of nutrients then wash right out of the soil make sure your plants get the most out of any fertilizer by checking your soils pH first. Nutrients are most available as soil pH is in the sweet spot of 6.0 to 6.5. 0 Response to "Benefits of Organic Fertilizer"